Buffalo Trace Distillery is a distillery in Frankfort, Kentucky, that is owned by the Sazerac Company. It has historically been known by several names, including the George T. Stagg Distillery and the Old Fire Copper (O.F.C.) Distillery. Its namesake bourbon brand, Buffalo Trace Kentucky Straight Bourbon whiskey, was introduced in August 1999. The company claims the distillery is the oldest continuously-operating distillery in the United States. The company says the name "Buffalo Trace" refers to an ancient buffalo crossing on the banks of the Kentucky River in Franklin County, Kentucky. The Sazerac Company purchased the distillery in 1992. Under its old name, George T. Stagg Distillery, the property was listed on the National Register of Historic Places on May 2, 2001, and designated a National Historic Landmark on March 11, 2013. The company claims the distillery to be the oldest continuously operating distillery in the United States. Another distillery with similar historical extent is Burks' distillery, now used for production of Maker's Mark. According to its citation in the registry of National Historic Landmarks, Burks' Distillery's origins extend to 1805, and Burks' Distillery is listed in the Guinness Book of World Records as the oldest operating bourbon distillery. Records indicate that distilling started on the site that is now the Buffalo Trace Distillery in 1775 by Hancock Lee and his brother Willis Lee who died in 1776. The first distillery was constructed in 1812 by Harrison Blanton. In 1870 the distillery was purchased by Edmund H. Taylor and given its first name, the Old Fire Copper (O.F.C.) Distillery. Taylor sold the distillery eight years later to George T. Stagg along with the Old Oscar Pepper Distillery. This second distillery was sold within the year to James Graham, in order to add more land to the O.F.C. Distillery. In 1886, Stagg installed steam heating in the storage warehouses, the first climate controlled warehouse for aging whiskey in the nation. During Prohibition, the distillery was allowed to remain operational, in order to make whiskey for "medicinal purposes". In 1972 Gary Gayheart became the master distiller. After his retirement in 2005, he was succeeded by Harlen Wheatley. In 2016 Buffalo Trace Distillery announced plans to expand operations with a capital investment of $200 million. In October 2016, during renovations to convert a building to a meeting and event space, workers discovered the foundation of the original 1873 distillery building, which burned down in 1882, along with the remains of fermenters from that same year. The original distillery foundation was left in place after the fire and an expanded distillery building was built as a replacement. The site is now open for visitors to Buffalo Trace. Production capacity at Buffalo Trace is estimated at about 2,650,000 US gallons (10,000,000 L) of whiskey per year. This is carried out at a beer still with a capacity of 60,000 US gallons (230,000 L). While Buffalo Trace Distillery is mainly known for its bourbon, it also produces other spirits such as rye whiskey and vodka. 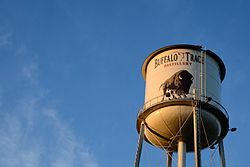 "Buffalo Trace" is also a bourbon brand made by the distillery that was introduced in August 1999, two months after the distillery changed its name from the George T. Stagg Distillery. Buffalo Trace also produces spirits for private bottlers and store brands. ^ a b c "The Buffalo Trace Distilling Company". ellenjaye.com. 2001. Retrieved September 23, 2007. ^ Lew Bryson. "Bourbon Company, Bourbon Man Buffalo Trace Distillery & Mark Brown". Malt Advocate. Malt Advocate, Inc. Archived from the original on January 20, 2008. Retrieved December 5, 2007. ^ "Secretary Salazar, Director Jarvis Designate 13 New National Historic Landmarks". March 11, 2013. Retrieved March 14, 2013. ^ Burks' Distillery Archived November 7, 2012, at the Wayback Machine, National Historic Landmarks, U.S. National Park Service. ^ Oldest Operating Bourbon Distillery, Guinness Book of World Records. ^ Oldest Operating Bourbon Whisky Distillery, Guinness World Records plaque, Waymarking.com. ^ "Buffalo Trace Kentucky Straight Bourbon Whisky", Uisce Beatha, Retrieved on March 3, 2015. ^ "National Register of Historic Places Registration Form". National Park Service. March 13, 2001. p. 33. Retrieved January 31, 2011. ^ "Buffalo Trace Distillery Expands With $200M Investment". Stateways. Retrieved May 25, 2016. ^ "Buffalo Trace Distillery unearths foundation from 1873 distillery" (PDF). Buffalo Trace Distillery. Retrieved May 3, 2018. ^ "Great Bourbon". Buffalo Trace Distillery. Archived from the original on March 29, 2010. Retrieved May 17, 2010. ^ "Buffalo Trace distillery official website". Retrieved March 15, 2018. Taylor, Richard (2002). The Great Crossing: A Historic Journey to Buffalo Trace Distillery. Frankfort, KY: Buffalo Trace Distillery. ISBN 0971683719.